Happy Fri-YAY! I have been marble obsessed. Who hasn't? From little details to big pieces. I wanted all the things. Especially some of those West Elm mid-century modern coffee tables. Well, I am living in a teeny-tiny apartment in New York City. All my furniture is from IKEA, and though, I am not planning to move for awhile, eventually I will have to move, so investing in furniture isn't on the radar right now. I feel like I haven't done a DIY in forever, so I decided to give it a go after stumbling upon the secret ingredient to this project. Now, DIY-ing furniture may seem like a big task, but this was the simplest thing ever. And it can cost less than $10 or less than $20. Either way- a bargain. The secret material in this case is marble-patterned contact paper. Basically, it's a big giant sticker that is intended to be used to line drawers and such. I wanted to mix up some of the backgrounds on this here blog and when I came across this at the discount store for less than $2, I decided to give it a go. I was really just going to use it on a piece of cardboard and call it a day, but instead decided to give my IKEA Lack table a facelift. The trick is actually that it's two IKEA Lack tables. I had the brown one since moving into apartment. So, I stole the legs off that one. For the marble base, I bought a second Lack table-in white-for $7. I covered the top with my marble contact paper. Carefully smoothing out an inch at a time with an old credit card. 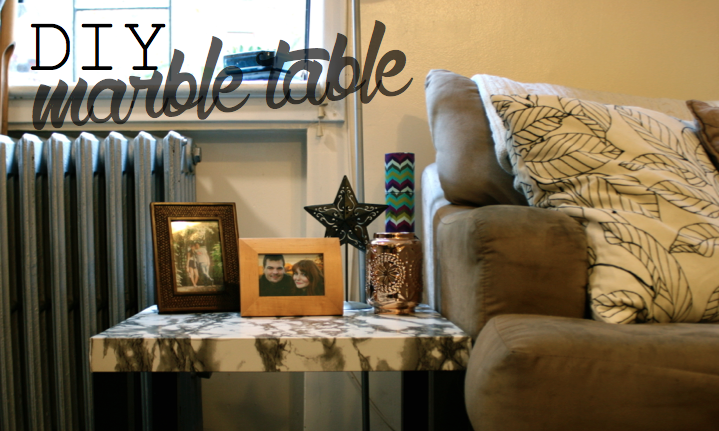 The marble contact paper is a bit sheer, so going with the white table was the perfect choice. Pairing it with the brown legs, made it look a bit classier. Now, this isn't going to fool anyone, but from afar it looks quite nice. And hey, I was using an Ikea table anyway, so at least it's more personalized. Are you a fan of marble furniture?